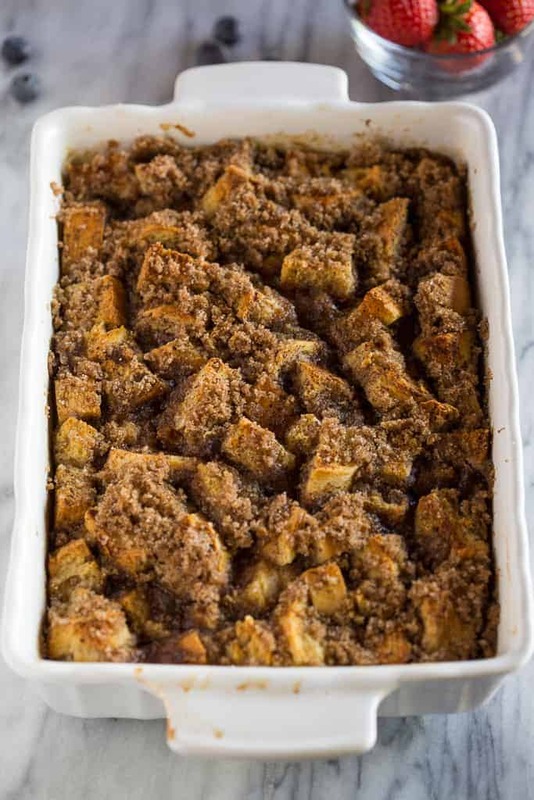 Quick and easy Baked French Toast Casserole you can make the day before and refrigerate overnight so it’s ready to bake and enjoy in the morning. 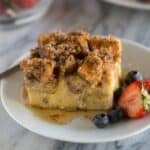 Baked French Toast is a quick and easy overnight casserole that tastes great and can be completely made ahead of time. I’m in love with breakfasts you can make ahead of time and simply throw in the oven in the morning, like Breakfast Casserole, or Overnight Cinnamon Rolls! This Baked French Roast reacip was adapted from Our Best Bites–one of my favorite food blogs! 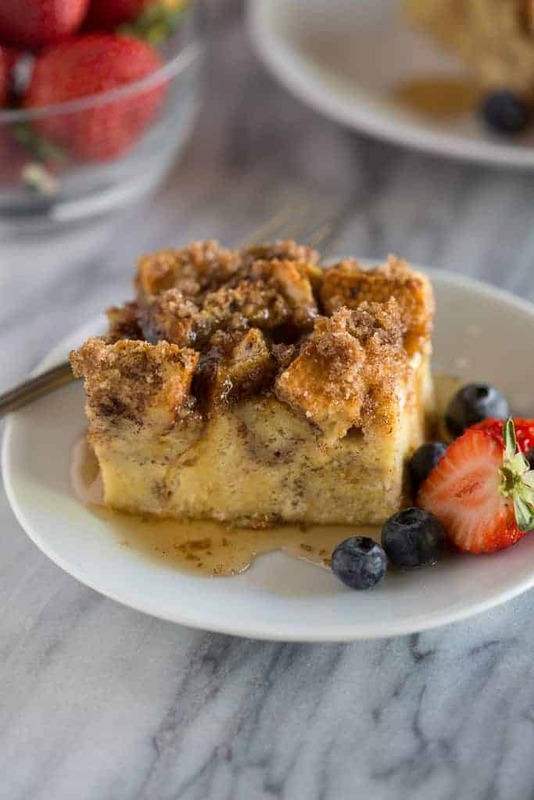 Baked french toast is sometimes called “French Toast Casserole” or “Company French Toast” and it’s the perfect breakfast to make when you want have something fun and special to serve for breakfast but you also want to relax and enjoy the morning. My guests rave about this dish every time! It’s so flavorful and delicious–and it takes all of 15 minutes to prepare the night before. It makes the perfect breakfast for Christmas morning, or other special holidays, or just when you have some company staying with you and you don’t want to stress in the kitchen in the morning. 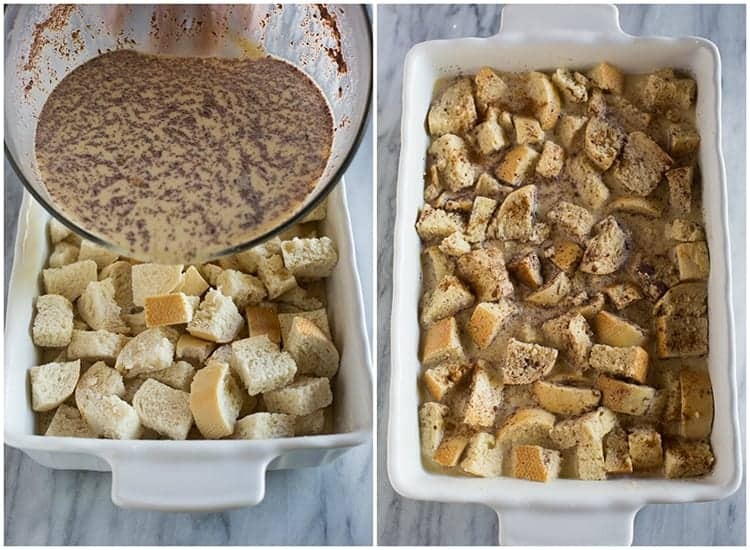 Start by cutting your french bread into chunks and placing them in a greased 9×13” baking dish. Next, in a large mixing bowl, combine eggs, half and half, brown sugar, cinnamon, salt, and vanilla and mix well. Pour the mixture over the bread crumbs. Gently toss the mixture and refrigerate it overnight. You can also make the topping for baked french toast ahead of time. Combine the sugars, cinnamon, and nutmeg in a bowl. Then cut in the cold butter and refrigerate until you are ready to bake the french toast. Sprinkle the topping over the french toast and bake for about 45 minutes or until the top is golden brown and the egg mixture at the bottom is set! This recipe makes crispy french toast right in your oven! Yes! This french toast casserole is made in the oven. Baked french toast can be made a day in advance and results in crispy french toast made right in your oven. How long should you bake french toast casserole? Bake your french toast casserole at 350 for 40-50 minutes or until the top is golden brown and the casserole has set. 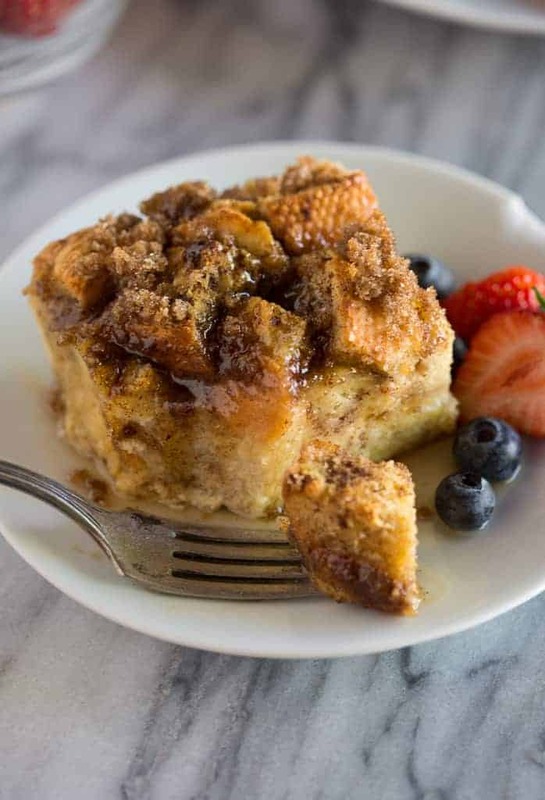 Quick and easy Baked French Toast Casserole you can make the day before and refrigerate overnight so it's ready to bake and enjoy in the morning. Lightly butter the bottom and sides of a 9×13'' baking dish. Cut bread into 1 inch chunks and place in dish. Crack the eggs into a large mixing bowl and whisk to combine. Add the cream and milk, brown sugar, cinnamon, salt and vanilla and mix well. Pour evenly over the bread cubes. Gently toss the bread around a little to make sure the top and bottom pieces all get dipped in the egg mixture. Spread out evenly, cover dish, and refrigerate overnight. At this point you can quickly make the topping before hand, and leave it in the fridge overnight. Place brown sugar, white sugar, cinnamon and nutmeg in a bowl and stir to combine. Cut cold butter into small chunks and add to the bowl. Use a pastry cutter or your hands to combine the mixture until crumbly. Cover and refrigerate until morning. When ready to bake preheat oven to 350 degrees F. Uncover your french toast pan and sprinkle the topping evenly over top. Bake for 40-50 minutes or until top is golden brown and egg mixture is set at the bottom. (It only takes me about 43 minutes to bake, but time may vary depending on your oven). Allow french toast to cool for 5-10 minutes before cutting it into squares. We don't top ours with anything but fruit, because I think it's completely delicious plain! But you may want to try it with syrup, powdered sugar, whipped cream, berries, or any other toppings you'd like! *I originally shared this recipe in June 2014. Updated December 2018. Fun recipe! Everyone loved it. Can you substitute challah bread for the french bread? Sure, that would be fine 🙂 Hope you love it! Ingredients says cream, instructions say half and half. Safe to assume either is fine? My family lived this! I made two versions, one per the recipe and one with an egg substitute for an allergic person. One note on the egg substitute version, use less liquid than called for. WOW! I made this with a loaf of cinnamon chip bread for Christmas morning & it was phenomenal! This has good flavor but is way too sweet for my family. We like what I refer to as European sweet. In Europe sweets have a lot less sugar than American sweets. I loved the crunchy topping so I think I will omit the sugar in the batter the next time I make this. Could it be done in a Crockpot? Hi Tabitha, I’d at least give it an hour or more to soak into the bread, before baking, if possible. Hi, this recipe looks so good and I want to make it. I’m thinking of adding bananas to the top. Should I add those at the same time of the topping? Sure, if you want the bananas to get cooked (and they will brown). Or you could serve them fresh sliced over the top at the end.